Living in the beautiful hills of Shivapuri National Forest Reserve, overlooking the bustling sprawl of Kathmandu Valley, the flourishing community of over 100 nuns at Nagi Gompa are engaged in intensive study, practice and retreat, in order to realize the enlightened mind and be of service to others. 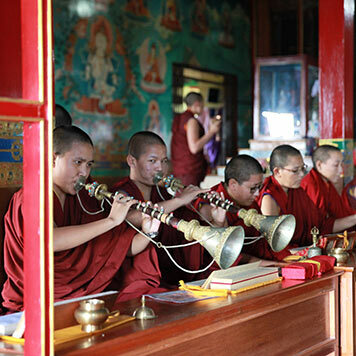 The nuns of Nagi Gompa have a full day devoted to study and practice. They learn all aspects of the path—from philosophy to ritual—in order to tame their minds and serve others. Here you can find the year-round Group Practice Schedule at Nagi Gompa Hermitage, according to the Tibetan calendar. Copyright © 2018 Ka-Nying Shedrub Ling Development Trust. All rights reserved.